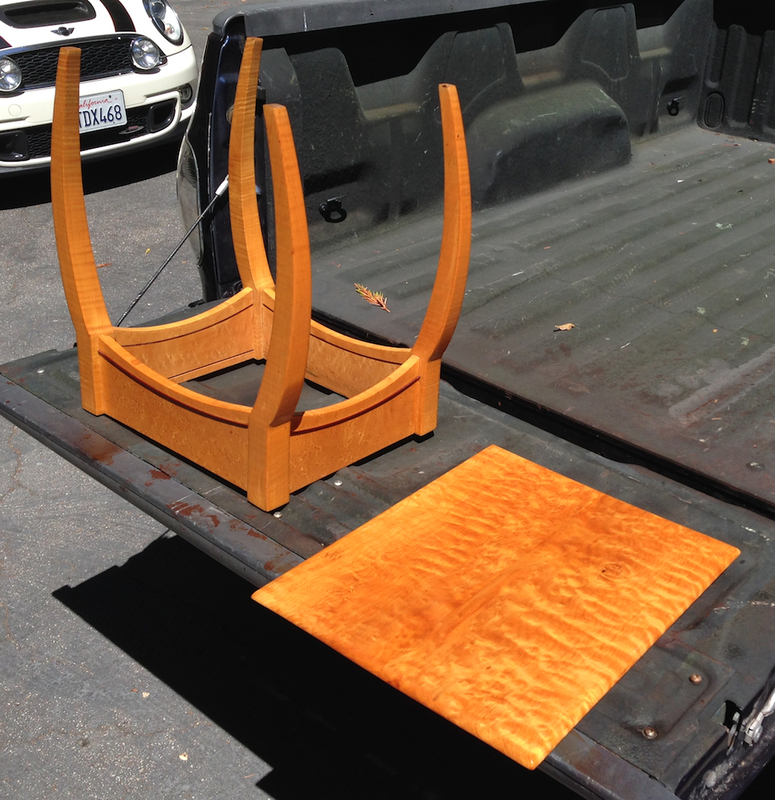 Yesterday I set up my finish stands outside again and shot the Thorsen cabinet and Spider table with some shellac. I’d left off on both with having given them a base coat of linseed oil. The Spider table top had been sanded to bare wood, it had gotten at least 4 coats of Linseed Oil over the course of a week or so, the quilted western maple really drank up the oil. I let it dry a week to make sure there wouldn’t be any oil seeping back out later. I mixed Blond Shellac with just a small bit of Garnet Shellac (4 parts clear to one part garnet) and reduced it to about a half pound cut, then shot several coats on the base and top. The top got a few more passes then the base. It’s fairly smooth, I’ll rub it out with steel wool and wax next week and re-attach the top so I can put this back into service. 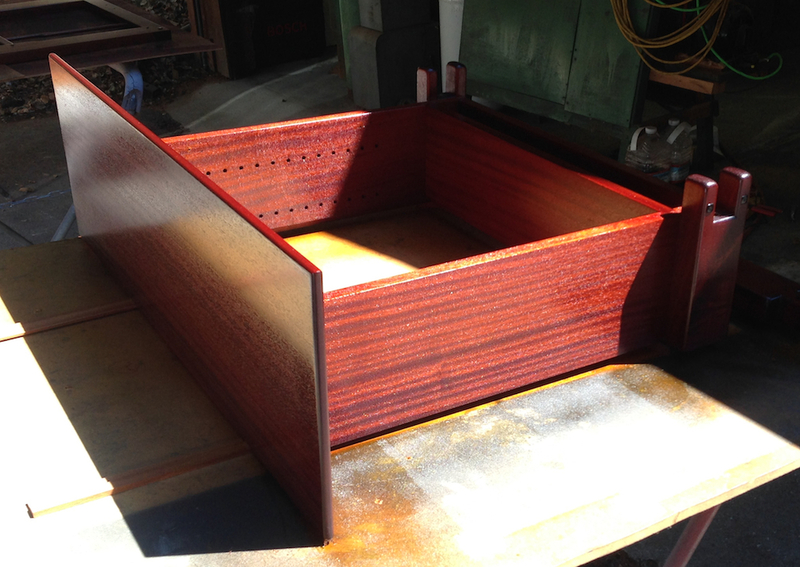 Then I loaded my spray gun with straight Garnet Shellac, diluted to about a 1/2 to 3/4 pound cut and sprayed several coats on all parts of the Thorsen cabinet. At one point I got some dry spray on the door — it looked like a fuzzy brown mold. I waited for it to dry, then used a scuff pad to take it down smooth, then shot a nice wet coat over the entire door and it all melted beck in. The pictures aren’t great — my iPhone takes nice pictures when the light is even, when there are sharp contrasts due to lighting it’s not so happy. As usual, outside in the sun the parts look very red, inside the shop they look very brown, the reality (in person, in the house) is in between those two extremes. 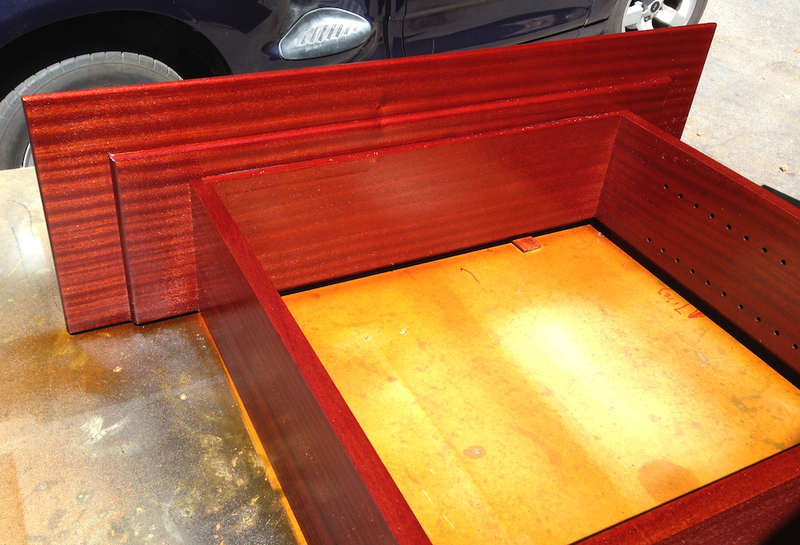 I wanted enough Shellac on these parts to give them some gloss and add some color, but not to obscure the grain. 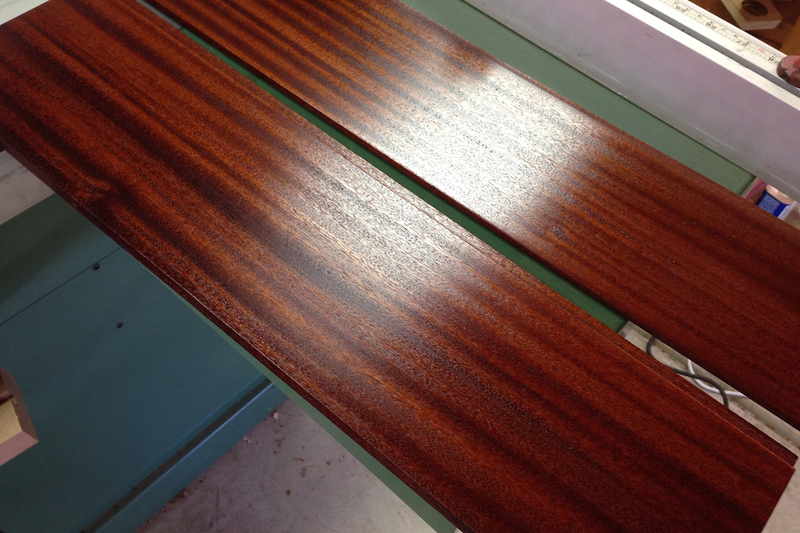 If I wanted a glassy smooth surface I’d need to sand and re-shoot them to make sure the grain was filled with shellac. The final step will be to rub them out using 0000 steel wool and a colored Briwax. The was will fill the grain and add some interest to the final color. And that’s as far as I can go on this project for a little while. I want to give the shellac a week to completely cure so I don’t rub through it (ask me how I know). I started on the stained glass, but cracked the only piece of this special clear I had, and it will be 10 days before I get more glass in. So I’ll have to figure out something else in the shop to keep me busy for this week. Looking at your spider table I can’t help but think that the legs would look better (to my eye) if they were turned at a 45 from the aprons. 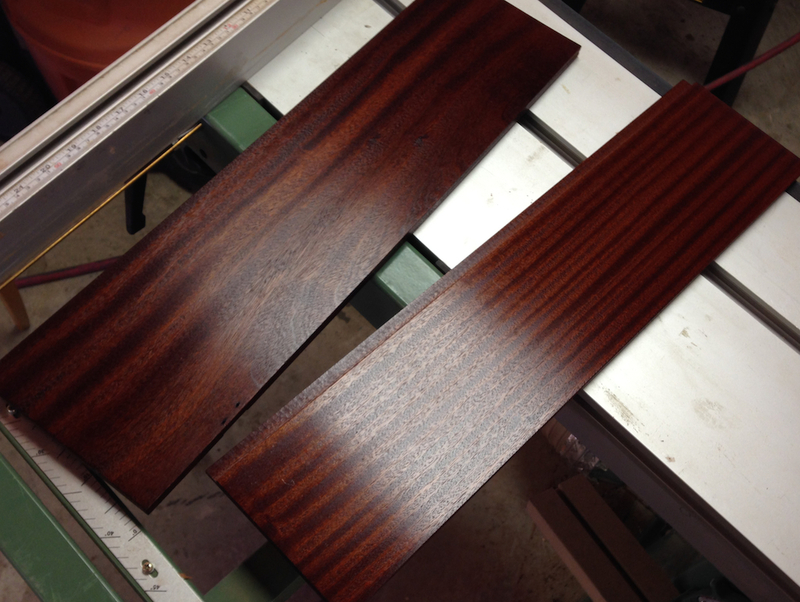 You do have a new bandsaw that you can experiment with and get to know making veneers. Ralph, I totally agree. The occurred to me when I first built it, but since I designed it in 2D it ended up looking sorta 2D. I could exaggerate the “spider” look a lot more. Maybe I’ll “CAD” that idea this week. That Garnet shellac sure looks sharp on there! I’ve been meaning to try shellac on my next applicable project. I know that this is the realm of opinion, but what colors do you like with what woods? 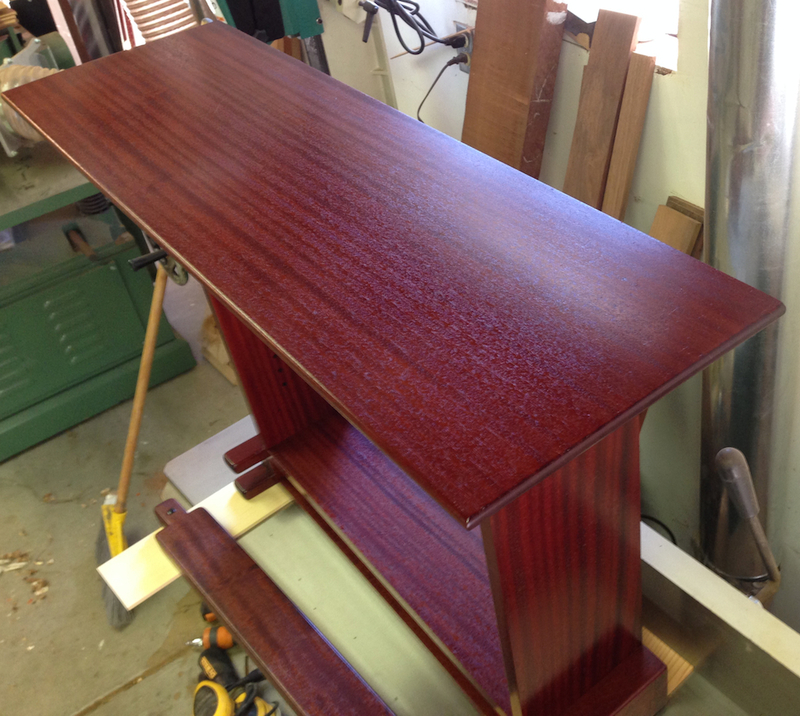 I’m still learning and experimenting — but for Sapele I like this recipe. I’ve used Orange shellac on several pine projects, next time I’m going to use either garnet or garnet+clear, depending on how glossy I want. 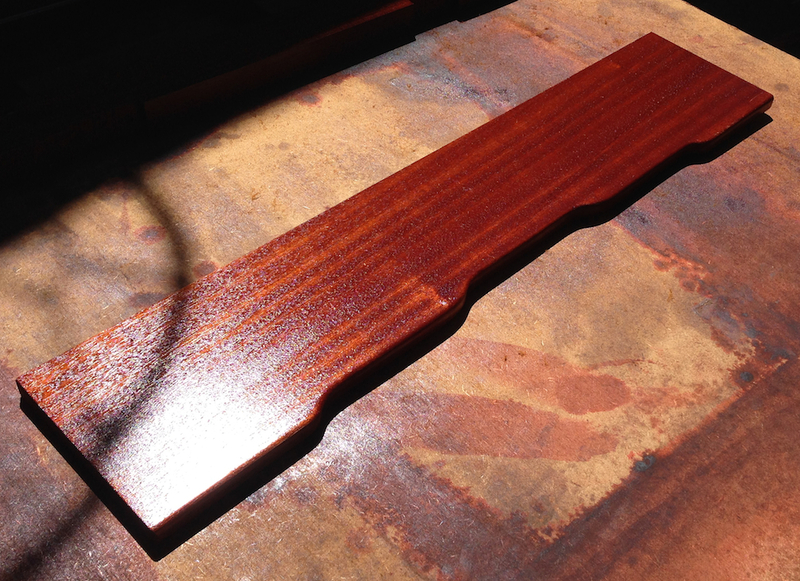 It’s worth experimenting with different finish approaches on any project, I always do that.